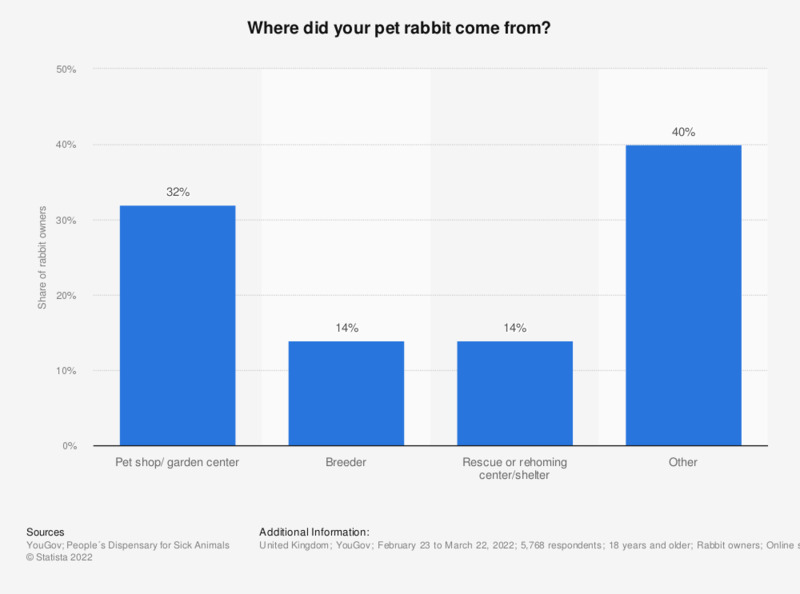 Where did your pet rabbit come from? This statistic shows where rabbit owners originally got their pet rabbits from in the United Kingdom in 2018. According to the survey, fifteen percent of rabbit owners got their pet from a family or friend. What research was carried out before getting a rabbit? Which of these do your rabbits do on a daily basis? Which of the following characteristics does your rabbit show on a weekly basis? What feelings do owners experience as a result of owning a rabbit? What do you plan to buy as Christmas gift for your dog or cat? What is the main source of information you use when deciding how much to feed your rabbit? Which of the following tend to influence you to give your rabbit a treat?